IT IS a lesson in corporate opportunism. They'll invest and reap the profits, provided nothing goes wrong. The dubious machinations of the US chemical giant, DuPont, came to light recently with revelations of a diabolical set of clauses it has built into its tie-up with India's Thapar group. The revelations have immediately triggered off the next round of agitation against the Thapar-DuPont's Nylon 6,6 plant in Goa. These provisions of its agreement with the Thapars absolves DuPont from the responsibility of meeting damages in the event of any industrial disaster that may occur in its plant in future. DuPont's agreement with the Thapar group contains a clause which reads, "DuPont shall not be liable in any manner, whatsoever, to Thapar DuPont Ltd, or to any third party, for any loss or damage caused to persons or property, including to members of the public as well as to the person or property of any employee of TDL, and TDL shall indemnify DuPont against liability." Leaving nothing to chance, DuPont is also keeping other escape routes open. 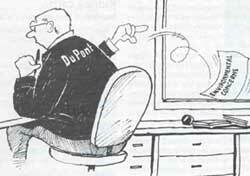 The agreement allows DuPont to dump all its shares on the TDL within 30 days if it finds that "Indian legislative or judicial development do not justify its continued participation." This has generated extreme cynicism among Goa's environmentalists. Says Norma Alvares, an environmental lawyer, "It is like going in for a marriage and stipulating it beforehand that you will have nothing to do with the kids who might come along as a result." Already, the US $200 million joint venture is under fire in Goa, triggered by a fierce campaign against the grave environmental impact it could have. The project will deplete drinking water and strew the environment with toxic effluents. There have also been allegations about forcible seizure of land from the villagers for the plant site by the government, after the TDL sought permission to set up the factory in 1986. Faced with strong opposition in Goa, the company is now considering the possibility of shifting the plant to an alternative site. Meanwhile, other state governments like Orissa, Karnataka, Maharashtra, Andhra Pradesh and Tamil Nadu have invited the TDL to set up the plant in their states. Although the company's top brass is tightlipped about the proposed site in Karnataka, state chief minister Deve Gowda has already announced that the plant would be set up in his state. But TDL managers are under no illusion about the reaction that the project might provoke in the other states. They admit that environmental concerns can toss the project into an early grave. However, provoked by the controversy, Gautam Thapar, managing director of TDL, lashed out, "We have asked the Centre to tell us what sort of guarantees a foreign investor has on its investments after it receives clearance." Meanwhile, DuPont has sought the intervention of the US embassy in resolving the crisis, and the Thapar group has approached the prime minister's office, requesting an investigation into the agitation in Goa.